I've got Skyla, from Sanity Fair, here for the last day of my 31 Days of Pink Series. 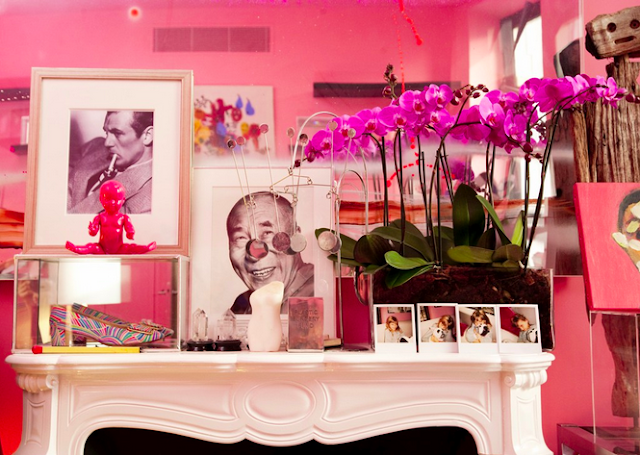 Skyla's incredible apartment was just featured in The Washington Post. You can read all about her and see photos here. I just had to blush a bright pink when The Pink Pagoda asked me to do this post! How could I say no? When Jennifer began this series, I immediately recalled Audrey Hepburn and Fred Astaire in Funny Face, that giddy, bubbly, and very pink classic film from 1957. Funny Face is mostly set in Paris, and features the best song ever written about a color: Think Pink! "Red is dead, blue is through/ Green's obscene, brown's taboo/ And there is not the slightest excuse for plum or puce - or chartreuse." "Everything on the great horizon/ Everything that you can think / And that includes the kitchen sink/ Think Pink!" 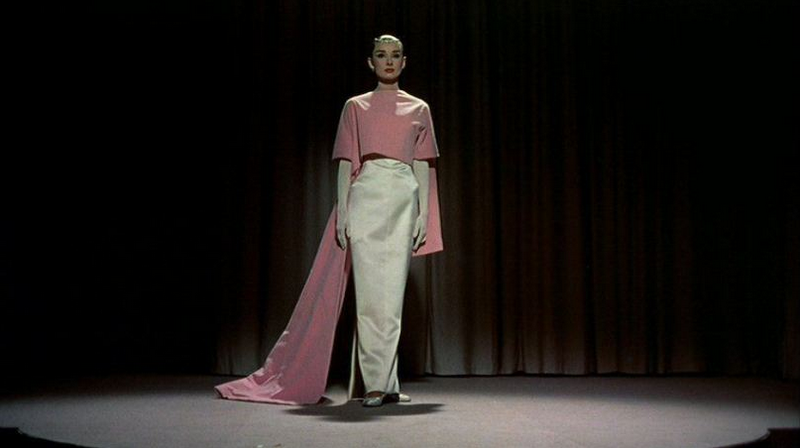 Audrey Hepburn in Funny Face, "thinking pink. "The wardrobe for Ms. Hepburn was designed exclusively for the film by Hubert de Givenchy. Funny Face is filmed in some of Paris' most beautiful locations, so for pink interiors, where better to look than the city famous for Le Vie en Rose? From the walls of Monet's Giverny just outside of the city, to the bubbly French Veuve Clicquot rose champagne served at the Ritz Hotel, "Parisian Pink" is the most elegant hue of all. 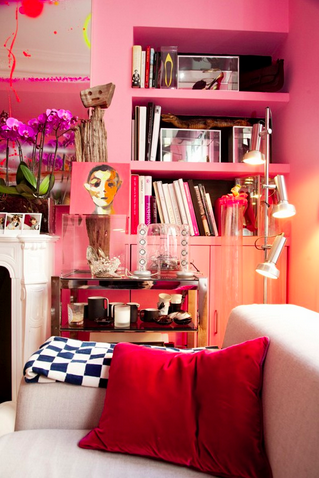 Take the iconic pink office of legendary muse and model Ines de La Fressange. 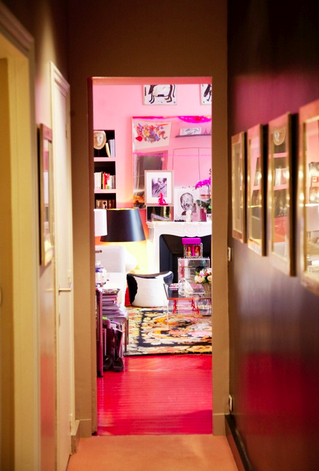 A French aristocrat and once-muse to Karl Lagerfeld, La Fressange's Paris office is an eclectic mix of decor and fashion with a very lived-in feel. I especially love the blend of classic black and white portraits with Roger Vivier flats styled as rare collectibles in lucite boxes. 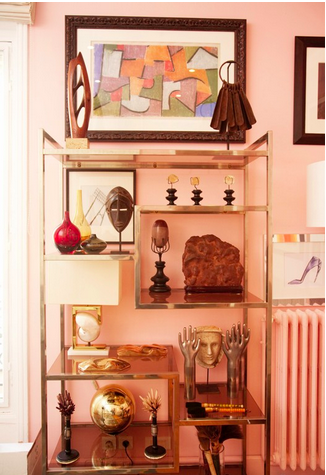 The feeling is global: An African tribal mask, ostrich egg, and brass objets d'art fill a gleaming etagere. Even the floor and doorframe are pink - if you saw this door ajar from down the hall, wouldn't you feel compelled to enter? Her liberal use of black as an accent color is very visible here; it keeps the look adult. Black and white artwork, black interiors to the bookcase and fireplace, and black accents in the lampshade and rug keep this cotton candy confection from floating away. 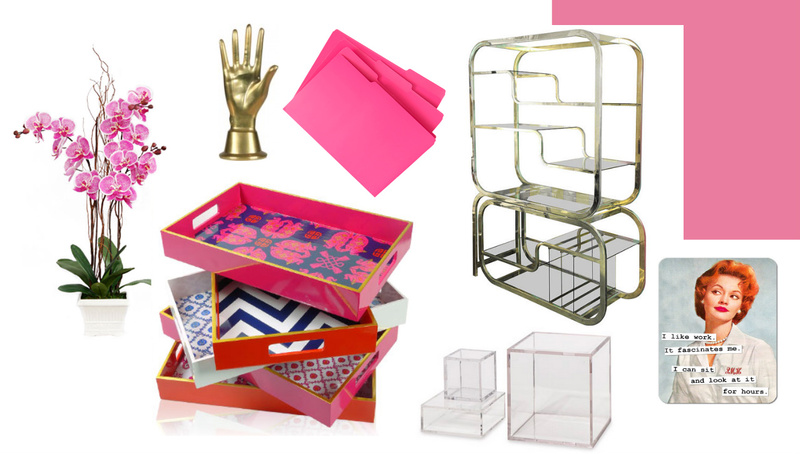 Care for a little Parisian Pink in your home office? Get the look! What a perfect way to wind up my pink series! Thank you for sharing your fantastic taste with us today, Skyla! Visit Sanity Fair here to see more of Skyla's amazing aesthetic. And be sure to read aout her in the Post's feature. She's quite an interesting and talented lady.